I’ve had recycling a dog food bag on my to-do list for quite some time. I’ve saved several of the plastic webbed food bags and just needed to rinse them out and upcycle them into tote bags. The first step was to remove the dog food odor and clean them. I opened the bottom seam of the bag as it was just taped closed. I washed them out in the bath tub and then rinsed once with white vinegar and let them air dry. There still was a hint of dog food smell so I sprayed down the inside of the bag using a homemade citrus-vinegar solution. After another rinse and dry, the bags smelled clean with no hint of dog food. Once the bags are all clean and dry, I was ready to start cutting. For the larger tote, I cut the bottom off just above the writing and details of the bag. I did this to try and eliminate some of the boring part of the bag. I then cut part of the top off and folded over the top edge twice to make a nice hem. The finished size of the recycled dog food tote bag is 17 inches tall, 15 inch wide and 6 inches deep at the base. I used some webbing strap material to add the handles and just folded them under the hem before sewing the top hem in place. This secured the handles in place and hid the ends of the webbing. The finished length of the handles are 10 inches long on my bag shown. Here is the inside of the tote bag with the bottom sewn and the corners mitered to create a wide square base. I machined sewed the bottom closed first. Then I measured in 3 inches on each side to create a mitered corner which resulted in a 6 inch deep bottom on the tote bag. Check out this picture tutorial that shows how to sew and cut the mitered corners on the feed bag. 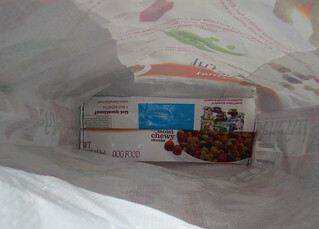 One bag I recycled was a smaller 13 pound dog food bag with a slider zip closure. I decided that I would leave the slider closure in place and just sew the bottom of this bag and add mitered corners so the bag could stand up and have a nice wide base. 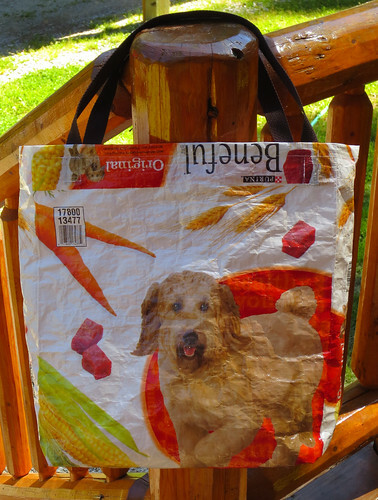 This style of a recycled dog food bag would be handy for storing things such as in a closet or in your vehicle. Another nice thing about these recycled tote bags is that they are very durable and somewhat waterproof too. You are doing a wonderful job by recycling items. Not many people would do these things. IT’S NOT RECYCLED, IT’S REUSED. THERE IS A DIFFERENCE. Hello B — I will address your comment to say that if I had just reused the bag for dog food, then yes it would not be recycled but rather just reused. But as I have altered or adapted it for a new use, I feel it is recycled into a new and useful item. 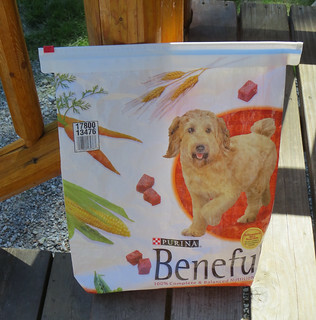 I actually used one of these dog food bags to put road sand in it for the winter and put it in the bed of my pickup for weight. 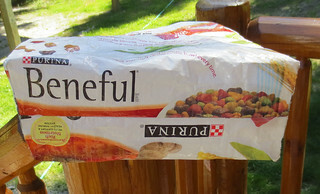 I truly believe this would be considered recycling the dog food bag as I am using it for altered purpose. Regardless if we agree on the term “recycled” for my dog food bags, I hope we can agree that reusing and repurposing old trash into new and useful things is the important factor here.